The best milk chocolate in the world? You know you need to read on and find out more. You may not have heard of Cacaosuyo, but if you care about fine chocolate, you will want to make a note of it. Founded by partners Eduardo Lanfranco and Sam Giya, Cacaosuyo is a new chocolate maker taking the chocolate world by storm. Producing full-flavoured chocolates, their ethos is to make chocolate exceptionally true to the Peruvian cacao varieties that they are working with in the growing country. In 2015 they truly broke into my consciousness when I was lucky enough to taste some memorable chocolates in judging the world finals of The International Chocolate Awards. They garnered multiple medals, including the world gold medal for best milk chocolate in world for 2015 with their fruity complex delight, Piura 50% milk chocolate. The 70% dark Piura is also stunningly bright and fruity, with a sweet honeyed middle note. My interest was certainly piqued – and was then fixed when I met Sam Giya one half of the team who have created this stunning new label – at the 2015 Salon du Chocolat in Paris. Sam is a wonderful ambassador for his chocolates, his enthusiasm is infectious, and it is clear that his product is wonderful because it is created with tremendous care and love. 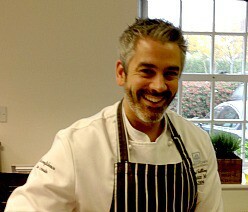 He also won my heart as he gave me some of their milk chocolate with crunchy quinoa, the absolute definition of moreish! Happily Sam agreed to an interview, so that I could bring you his story, the story of Cacaosuyo, and you too can be in on this delectable new discovery. The only thing you need to add is a tasting of their chocolate! 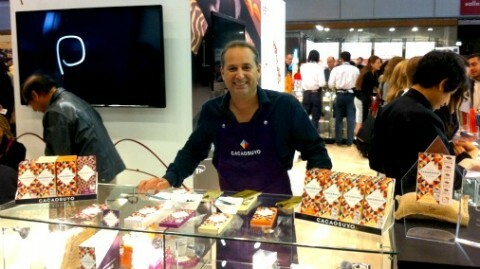 Sam Giya at The Salon du Chocolat Paris 2015. Tell me about your life before chocolate. I believe that all who have an artistic vein, may have it in different areas and one is cooking, along with singing, for me. 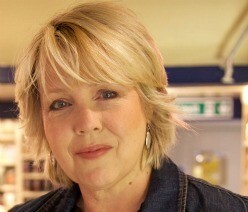 I love food and the adventure of flavour. So with success in business I thought I would invest in something else, something that would be more fun than the textile business I was in. I think my economics mindset led me to think about cacao since it is native to Peru and was getting more and more attention as an exportable commodity, that probably acquired some added value as a finished product, chocolate. We make chocolate in a way that the cacao variety we use preserves its own flavour. The idea is not to mask the taste that each cacao wants to give us, but rather let it show itself, keeping it simple and true to a very well treated bean. For us it is mostly about the post harvest process more than the actual chocolate production. If you use a well processed, high quality, flavorful cacao, you will get similar chocolate with the amount of sweetness you choose. 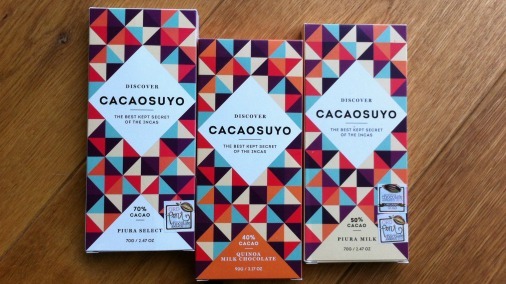 Cacaosuyo’s gorgeously packaged bars, proudly dislaying ICA medals. It is rare to be making bean-to-bar in the growing country, it must have been a steep learning curve for you. What have been some of your greatest discoveries? We began by investing in research and development of cacao flavour. Mostly in how the post harvest process would affect the cacao and of course the final product, chocolate. Having realized that cacao and chocolate was something very few people really new about in our country, we invited Venezuelan cacao expert Gladys Ramos to help us learn what was necessary for achieving excellence. The formula was supposed to be simple. I figured that if we had an amazing cacao fruit on the tree, we would take that through every process in the best way possible to eventually take that to production to get an equally amazing chocolate bar. This turned out to be simple in thought but complicated to learn and apply because we had to set up our own post harvest facilities, fermentation boxes, drying beds and complete laboratory, etc. as well as learning to properly taste cacao and chocolate. However, the effort yielded positive results. As far as greatest discoveries go, it would probably be that one can make an important impact in the fine chocolate industry by investing in quality. We never thought that we could be so well recognized right from the start. I am however very grateful for this and happy that the investment in learning before putting out has helped so much. We are discovering great cacao varieties and some are extremely rare that don’t even have a name yet, but all this will become available in bars to come. We have only started selling a little over two years ago, even in that short period of time, we see an incredible change in people’s minds about chocolate. This is a seriously special product. Once someone begins paying attention to flavour and quality, eyes are opened wide and there is no going back to just plain candy. 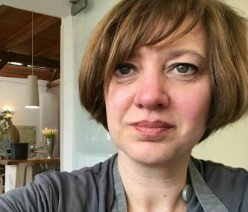 I believe we are already on the way to a wine like following, meaning that there are more people interested in tastings and excellence in chocolate. There doesn’t have to be one best, there will be many great brands that one can count on for quality and experience. Just as fine wine and fine food has evolved, so will chocolate, as it is becoming more sophisticated. Chocolate isn’t just chocolate any more. There are origins and varieties that offer an amazing adventure into flavour. 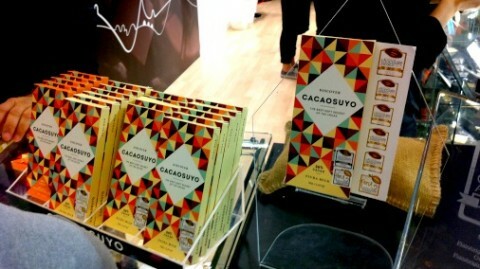 Bars on the Cacaosuyo stand in Paris. Have you always been into food? I have always enjoyed food, whether it was fine dining or cooking. It’s a passion as chocolate is today for me. Absolutely changed. This will happen with everyone that learns to detect defects in chocolate and of course when one discovers the magic in the fine flavors it can offer. 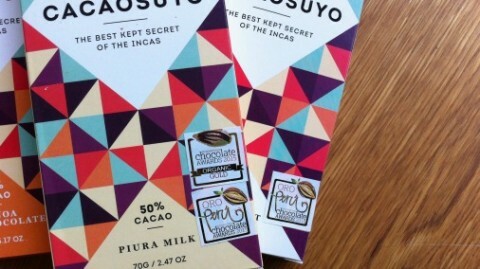 What is coming next for Cacaosuyo chocolate? What plans do you have for the chocolate and for your business? In general we are projecting growth into other markets, as well as continued development of different bars. We are very much into discovering flavors of cacao. Its about making Cacaosuyo an adventure to explore the different flavours of Peruvian cacao through our chocolate. Our brand is very much associated to design, whether it be flavour design or packaging, so you can expect to see a lot of Cacaosuyo before the end of the year. What is your own personal desert island chocolate? If I had to live with a limited supply of only one chocolate on a desert island it would be our Cacaosuyo -Lakuna, since one small piece can take me through a long voyage beginning with the fresh fruity flavor that always entertains me into trying to guess what fruits it actually reminds me of to later transition into an equally long honey stage before going on to the floral notes that float on by as if a bouquet were near, leaving a mild sweet deliciousness confirming that what just happened was pure pleasure.